The parish of Brundall is situated some six miles to the east of Norwich, on the River Yare, which defines its southern boundary. The name comes from the Old English for ‘Broomy nook’ or ‘Broom covered corner’. The location of the parish on the busy river probably accounts for its long history of settlement. It had certainly been in existence for some time by the time of the Norman Conquest, and has three entries in the Domesday Book of 1086. The earliest accurately dateable evidence of human activity in Brundall is from the Mesolithic, and comes in the form of four flint tools, three blades and a microlith (NHER 13319). Further flint implements have been found from the Neolithic period, including unspecified examples discovered early in the 20th century (eg NHER 10222), flakes and scrapers (NHER 10223), a polished axehead (NHER 10250), a chisel (NHER 14559), a knife (NHER 14560) and a leaf arrowhead (NHER 14561). 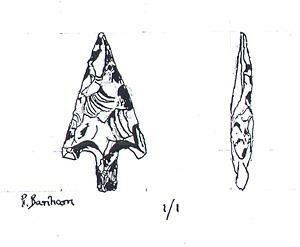 The only Bronze Age find in the parish to date is a barbed and tanged arrowhead (NHER 15466). However, a possibly Bronze Age ring ditch (NHER 16727) has been identified from aerial photographs. Ring ditches can be the remains of Bronze Age ditched burial mounds, or round barrows, that have been flattened by later cultivation. They are invisible at ground level, but the circular surrounding ditch shows as a darker mark from the air. This particular example may have an entrance causeway. There are currently no signs of Iron Age human activity, but the period of Roman occupation that followed gave the parish evidence of its earliest building (NHER 10227). Excavations between 1882 and 1887 revealed the remains of a large Roman building with brick and concrete foundations. Large quantities of Roman pottery fragments were also found. It has been suggested that the building stood on a Roman dockside, the river having since moved south. At about the same time, a heap of unfired bricks and pieces of pottery were found, suggesting the presence of a Roman kiln (NHER 10229). The parish’s nearness to the river also led to some discoveries that were quite hard to interpret. In the 1880s, some charcoal spars with nails in them were found, together with a Roman knife (NHER 10228). The spars seem to have been part of a boat, and are thought to have been either the remains of a Roman boatbuilding yard, or a Saxon boat burial. Since then there have been several discoveries of Roman pottery fragments (including NHER 10233, 10252 and 34694) and a silvered bronze Roman coin was found in a garden in 1942 (NHER 10230). Apart from the possible Saxon burial above, there have been Saxon pottery finds (NHER 10233 and 12969), and a probably Saxon skeleton was found in 1932, with an iron javelin and knife (NHER 10232). However, the most important Saxon discovery was made between 1880 and 1900, when the remains of a Saxon cemetery were found (NHER 10234). This consisted of a number of cremation urns, one containing human remains, and a brooch. 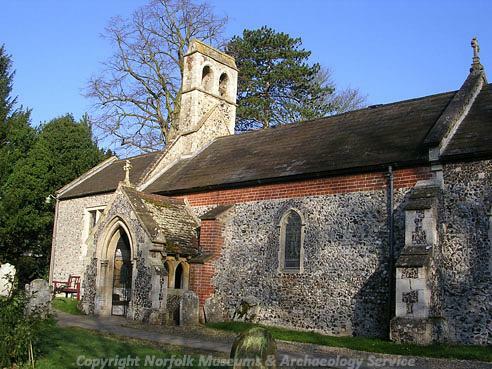 The medieval period following the Norman Conquest has left the parish with its earliest surviving buildings, the churches of St Lawrence (NHER 10254) and St Michael (NHER 10266). St Lawrence’s church is a small and unusual building, consisting of a 13th century nave, chancel and bellcote. The nave aisle was added in 1900, and the nave extended to the west in the 1970s. Inside is a 13th century lead font, the only one in Norfolk. St Michael’s church consists of a square west tower, nave, chancel, north porch and south organ chamber. The nave and chancel are 13th century, with some earlier work in the nave. Alterations took place in the 15th century, including the rebuilding of the tower and heightening of the nave. A south chapel was probably demolished at this time. The church fell into disuse in the 17th century, but came back into use in the 19th, when the south organ chamber was built. Inside, there is an unusual octagonal medieval font, and a World War One memorial east window. Other medieval buildings are documented, but do not survive today. St Clement’s chapel (NHER 10231) was a medieval church that was suppressed during the Reformation and fell into ruins, the remains of which were demolished in 1820. A medieval stone cross (NHER 13379) once stood to the east of St Michael’s church, but has long since disappeared. On a larger scale, the medieval village of Braydestone (NHER 11728), which was in the north east of the parish, and listed as having ten households in 1428, has vanished, and leaves no trace today. Surviving post medieval buildings in the parish include The Lavender House or Old Beams Restaurant (NHER 20958), a 17th century timber framed and thatched house that was formerly a pub; The Gables (NHER 15321), a building of 1746 in chequered brickwork, and The Manor House (NHER 15320), a former farmhouse that is a late 17th century rebuilding of a 16th century house. Adjacent to it is a converted 17th century barn with an 18th century roof. There was also a brick kiln in the parish (NHER 15582), marked on a map of 1797, but no trace of it remains today. The most recent NHER entry is a Royal Observer Corps underground monitoring post (NHER 35404) situated on the eastern boundary of the parish. This was opened in 1961 during the Cold War, and was one of a network of posts over the county, designed to monitor fallout in the event of a nuclear attack. It was closed in 1991, but is still intact, although locked. Pieter Aldridge (NLA), 6 June 2006.